Rana Bose has written two novels, Recovering Rude and The Fourth Canvas, and a third novel, Fog, will be published next year. He is on the editorial board of Montréal Serai. The compelling, contradictory nature of cover blurbs! They excite and prod the reader on. Depending on the era – from Jane Austen to Grace Metalious, from classic literary masterpieces to small town New England Americana in the ‘50s – they probe social inequalities, class privilege, adultery and sexual repression on a spectrum ranging from baronic landlord culture to gossipy, hypocritical suburban USA. Based on the corner of Vine and Maple, where everything wicked happened, Grace Metalious developed Peyton Place. At a time when pulp fiction had not yet swept the scene and easy treatment for cinematic conversion was not that prevalent, Peyton Place was made into a film, a sequel and a subsequent TV series. Of course, several versions of Pride and Prejudice have received film treatment. And a film has now been made about the far more madly captivating and meditative novel by Elena Ferrante, My Beautiful Friend, reflecting on sisterhood/girlfriends in a Napolitano village. Loren Edizel’s new novel, Days of Moonlight, follows. Is a film treatment possible? In all this, is the search for worldly context necessary to novels (and consequently to cover blurbs)? Sometimes blurbs feed subtle understated personal torment as a mysterious, elusive je ne sais quoi… things that cannot be glossed over. But do they gauge the socio-political epoch always? Blurbs can also help us look away and find deeper subterranean rivers and currents in the writer’s project. This novel has five cover blurbs – all very poignant comments – that incited me to look further for Edizel’s angst in writing this mind-bending novel. Beyond family secrets, mythological fabulousness, the dilemma between passion and intense conflict in discovering warmth and fleshy sexuality, irrespective of sexual preference, the madness of expulsions, population exchange and exile in one of the most intensely fought over religious and civilizational conflict zones in the world. This zone often continues to edge the world towards catastrophe today. What the blurbs do not call up is the extraordinary epochal sensitivity, as in this very progressive novel. And that is the undercurrent I most enjoyed. The worldliness. What Loren Edizel captures ineradicably is the minds – and signs – of those times, ranging from the ’twenties to the ’sixties, in Greece, Turkey and Crete… fatuous, silly, patriarchal and conquering inter-imperial societies, deep in economic disparity, interrupted by the clackety, banging sound of an iconic but poorly made Impala door, closing like a dog-eared pagemark of the times in an aberrant, impressionable, middle-class neighbourhood. Then there is the most invigorating gevrek boy’s street-savviness, determination and curiosity (in the mind of the narrator) to live and explore an adult world away from his street-hawking and gawking (“voluptuous pale flesh escaping from armpits, V-necks, and false pleats around hips… she is bursting at the seams…. Even stray dogs and tomcats get erections, when she sits on those steps”). Unbound jealousy and compliance to overbearing social mores are tearing him apart, as is the urge to follow through on undefined human pheromone commands. Contemporariness sweeps in often, whether it is watching Psycho, To Kill a Mocking Bird or Guns of Navarone and listening to the Stones or Mahalia Jackson or Moon River. Edizel’s words evoke shimmering memories of the times. The epoch is resplendent. With the end of World War I and a weakened Ottoman Empire pitting orthodox Christians and Muslims against one other, Anatolia was partly overtaken by the usual suspects – British, Italian, French and Greek – and that was the time Ataturk rose to the occasion with his well-propagated secularist visions for the region. While Izmir was burned to the ground, forced expulsions drew the line between progressive ideals and imperial geo-politics, at its veritable birth place. 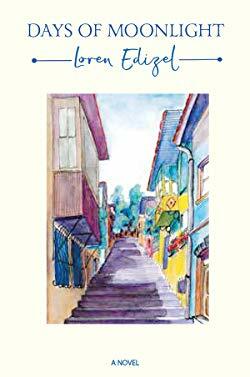 It is this progressive undercurrent – the quest for sobriety, for fun-loving fairness, for a tolerant, just world – that Edizel hearkens and laments. She records it all, down to the detail of a single sesame seed on a salty bun. There are exquisite pages and paragraphs of deeply felt internalizations, sheer nubile Botticellian rounded erotica. But there is always the subtle quest for a secular progressivism. If there is a minor hiccup, it is in the flurry of letter exchanges towards the end between the two women, who are desperately in love and cannot always define it, that hurry-the-novel-to-an-end. And in that end, while one of them yearns and pines away until she dies, the other stays pragmatically settled and yearns for a world they could not build together. Thousands of miles apart. A commendable well-written contribution to Canadian literature, by others for all others! More than moonlight!